When Daniel Lever is dragged to Leisure World Holiday Complex for some “time away” with his depressed dad, his expectations are low.Daniel is overweight, he hates sport, and his father has brought along his beloved tomato plant. But soon Daniel spots a girl swimming in the fake lake. Lexi is elegant and smart, but very mysterious. Why are her bruises getting worse each time she and Daniel meet? And is her watch really ticking backwards? 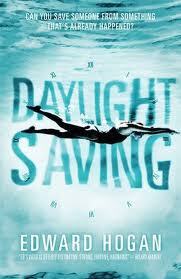 A dark figure stalks the pair, and as British summer time approaches, Daniel has to act quickly. Their souls depend on it. Categories: England, Paranormal, Thriller | Tags: Edward Hogan | Permalink.